There are many gravies based on Paneer. 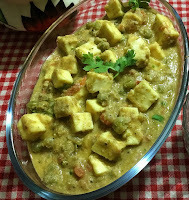 Today we are going to see a simple homestyle gravy prepared with paneer and green peas. This gravy will become your new favourite gravy with Paneer. 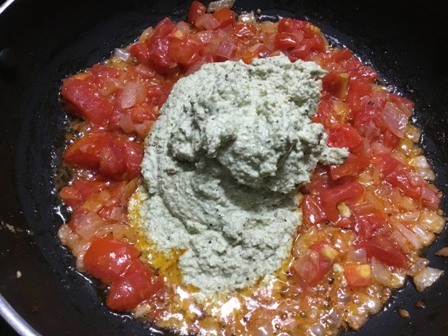 We often prepare paneer based gravies using fresh cream and onion tomato paste. 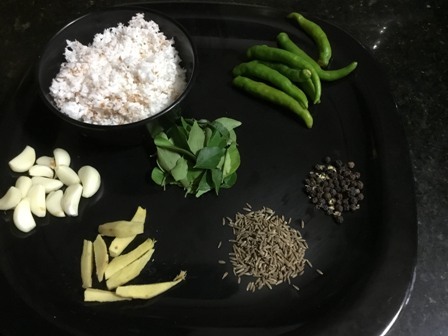 But this gravy is based on roasting the spices and then ground along with coconut. At times, we feel to eat simple and filling dish for breakfast or lunch by spending less time in the kitchen. In that situation, you can prepare this gravy within 20 minutes. The only tough job in this gravy is roasting the spices and then grinding. 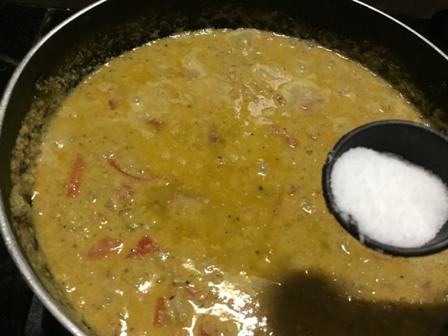 What makes this gravy unique is there is no chilly powder or coriander powder or garam masala powder. If you want to add garam masala flavour, sprinkle garam masala powder in the end. What I am feeling is that you don't need to add any other extra flavourings like garam masala powder or sabji masala powder. 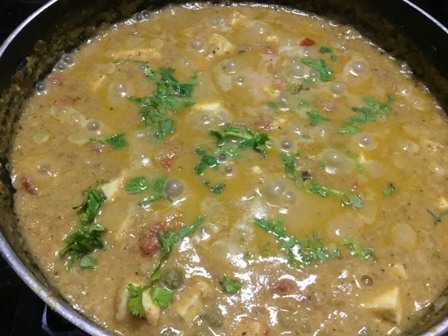 The other spices like black pepper, cumins, curry leaves and green chillies gives a mild and beautiful flavours to this gravy. Some people may feel without the flavour of fennel or cinnamon it's not tasty. So if you feel like that add the spices when roasting and then prepare this gravy. 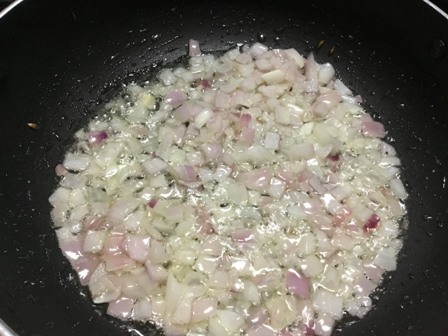 If you do not have panner you can substitute with potatoes or cauliflower. 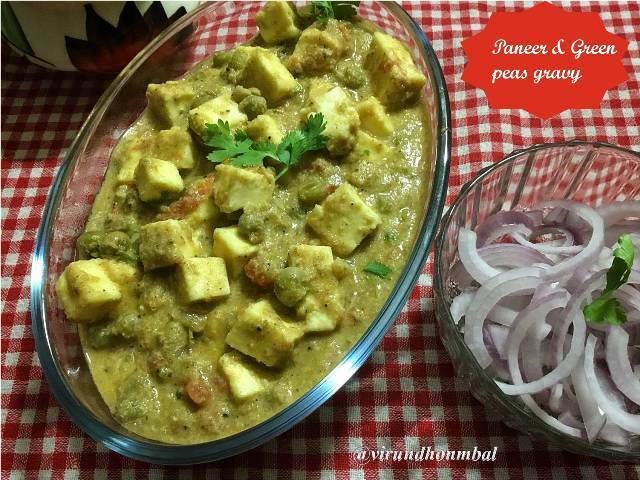 Paneer and Green Peas Gravy - Simple homestyle gravy using paneer and green peas. 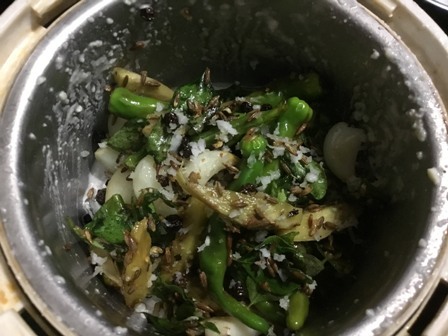 Quick and yummy side dish for roti, pulav and dosa. Cut the paneer into small cubes, chop the onions and tomatoes. 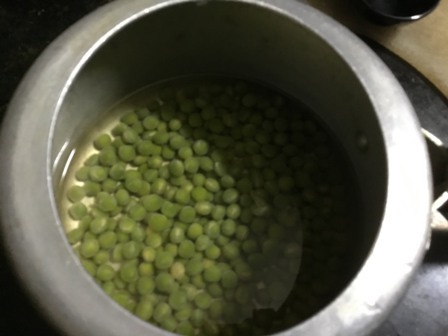 Soak the green peas for 4 to 5 hours and add the soaked green peas in a pressure cooker and close it with the lid. 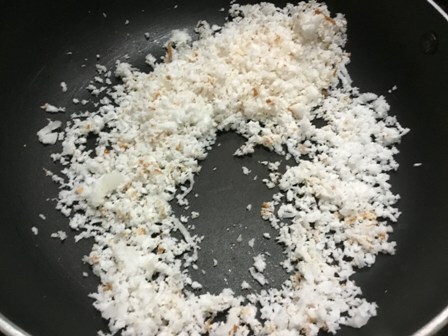 Heat a pan and roast the coconut gratings without any oil. Transfer the roasted coconuts to a plate. Heat a tsp of oil in the same pan and add the cumin and pepper. 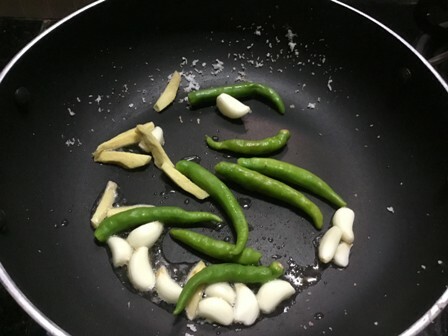 Fry them for a second and add the green chillies, garlic cloves, ginger and curry leaves. Fry them well for 2 minutes and transfer it to the roasted coconuts. 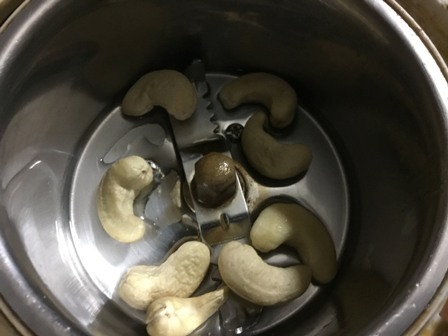 Grind the cashew nuts nicely with 1/4 cup of water. Transfer it to a separate bowl. In the same mixer jar, add the roasted ingredients and grind it nicely with 1/4 cup of water. In a large kadai or pan, heat the oil. Add the onions and stir fry over medium heat for 2 minutes. 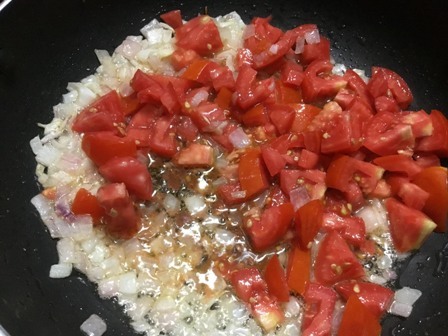 Next, add the tomatoes and saute for a few minutes or until the tomatoes turn soft. Add the ground coconut paste and saute. The paste should slightly sizzle around the sides. 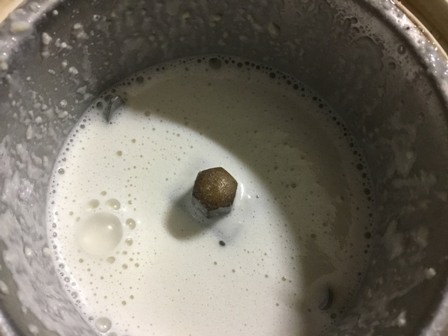 When the paste begins to separate from the oil, add the cooked green peas along with 1 cup of water. Add the required salt and mix them well. Reduce the heat to low and simmer the gravy for about 10 minutes. 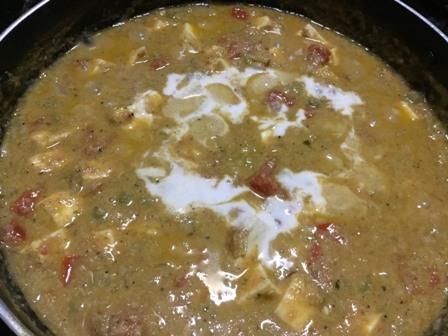 After 10 minutes, add the paneer cubes and mix them gently. 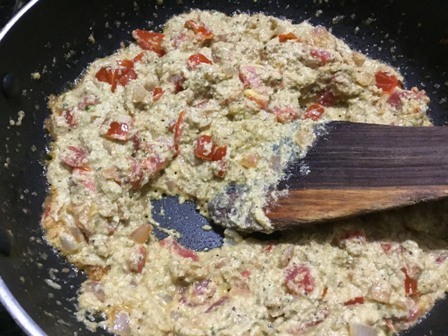 Add the cashew nut paste and (garamasala powder, optional) to the gravy and continue to cook for 3 minutes. Finally garnish with fresh coriander leaves and transfer it to the serving dish. 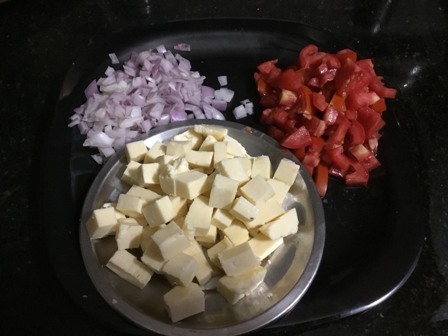 Cut the paneer into small cubes, chop the onions and tomatoes. Grate the coconuts and keep all the ingredients ready for roasting. 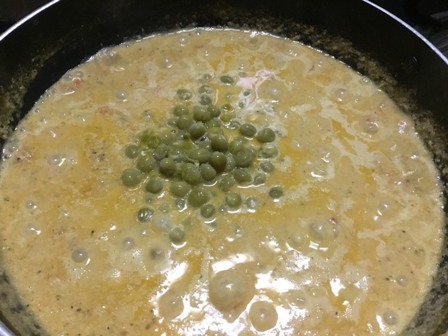 Soak the green peas for 4 to 5 hours and add the soaked green peas to a pressure cooker and close it with the lid. Keep the pressure cooker on medium heat and cook for 5 to 6 whistles. Allow the pressure to settle down naturally. In the same mixer jar add the roasted ingredients and grind it nicely with 1/4 cup of water. In a large kadai or pan heat the oil. Add the onions and stir fry over medium heat for 2 minutes. 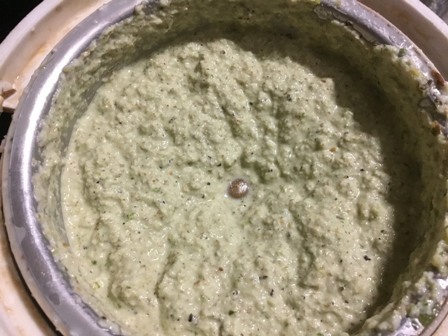 When the paste begins to separate from the oil, add the cooked green peas along with 1 cup of water. Reduce the heat to low and simmer the gravy for about 10 minutes. 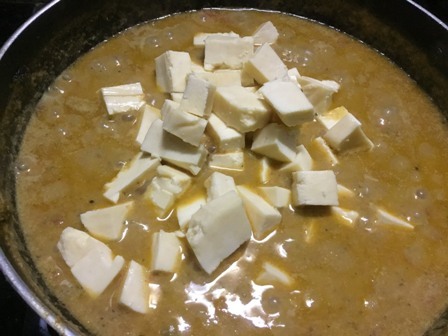 After 10 minutes, add the paneer cubes and mix them gently. Allow for a gentle boil and turn off the heat. Do not let the panner overcook and become chewy. Add the cashew nut paste and (garamasala powder optional) to the gravy and continue to cook for 3 minutes. Finally garnish with fresh coriander leaves and transfer it to the serving dish. Serve it with jeera rice, pulav, roti or dosa. You can also prepare this gravy using butter beans and potatoes.